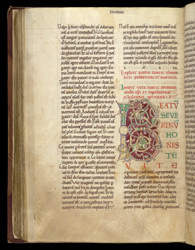 The daily round of prayers recited by monks (divine office) drew upon a number of different kinds of books: the psalter, Bible, hymnal, and collections of stories of saints' lives. The latter contained accounts of the deeds of the saints that marked them holy people. Excerpts from a saint's life might be read as part of the office on his or her feast day. Made in the early 12th century for the monastery of St Augustine, Canterbury, this English martyrology or passional has decorated initials--rare among martyrologies of its time--some with ingeniously designed decoration telling a saint's story. Not all the stories have historiated initials. Some are decorated with contemporary plant and animal ornament, as seen at the beginning of the life of St Severinus. The ornament resembles that of northern France but retains the expressive drawing characteristic of Anglo-Saxon art of the late 10th and 11th centuries. This letter begins the story of St Severinus, probably the 5th-century Bishop of Bordeaux and Cologne who fought arianism.